Since its inception in the early nineties, Fire Emblem has been forward-thinking with its humanisation of war. In a period when competing titles had players manipulate generic tanks and infantrymen for glory or without context, Intelligent Systems’ tactics series put a face to each of its warriors whilst recognising the ails of armed combat. Some character back stories were a mere sentence or two, yes, but the act of giving each one a name and personalised characteristics presented war simulation as something heavier and more personal than a game of mathematics. The sense of loss was conveyed to the player in a very primal fashion no other medium could achieve; when a player unit fell in battle, they were gone forever and a little part of you died with them. 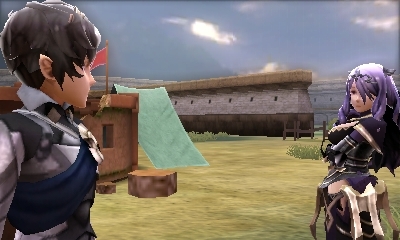 Related reading: A review of the first Fire Emblem to land on the 3DS - Awakening. Another good choice for fans of the genre! Where I’ve longed to see the series transform is in its conflicts. It has, in fact, played host to compelling adversaries that run the gamut from manipulative politicians to sympathetic royalty. There’s the heartbreaking tale of Zephiel, a kind-hearted youth who becomes unstable following childhood trauma, the smarmy but resourceful Lekain, who pushes political agendas from the shadows, and Mad King Ashnard, who represents humanity’s capacity for malice without noteworthy influence. Nonetheless, there’s a strong tendency for writers to point fingers at boogie men like ancient monsters. That plot device works as a criticism of the broader ideologies that lead to war in the first place, but far too often they feel like an excuse to bust out a cool-looking monster rather than pen a back story about characters with the psyche required to commit heinous acts convincingly. 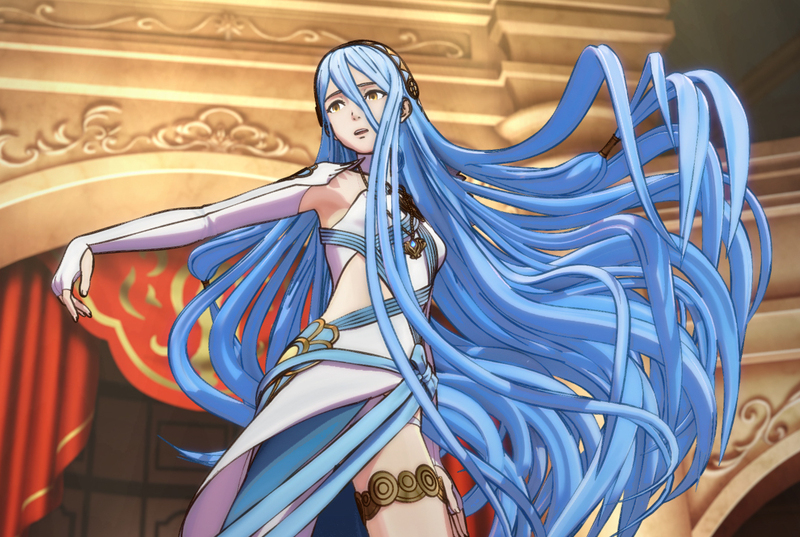 With Fire Emblem Fates, Intelligent Systems has sidestepped that issue and blurred a typically more black and white morality scale. Its plot revolutionises the supporting cast by matching traditional “heroes” with likeminded individuals but ultimately sees them all shed blood. The protagonist, Corrin, must decide whether to support his country of residence or his place of birth. This of course means those on the spurned side view Corrin as a turncoat that must be converted or executed. By giving protagonists and antagonists equal screen time and sympathy, the latest Fire Emblem becomes more dynamic in its portrayal of characters than ever. 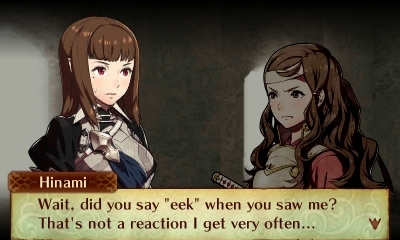 The games have always had enemy units that could be recruited via conversations in the midst of battle, but here that number is at a low. Instead, players must incessantly command their soldiers to slay would-be brothers in arms (had you picked to side with the opposing nation) that are, in their own way, fighting for a just cause. The result is a story that can be legitimately heart wrenching when, time and time again, Corrin must slay both misguided heroes and perfectly innocent parties. Fates is broken into two halves (there’s technically a third piece, but more on that one later): Birthright and Conquest. The former sees Corrin siding with his blood relatives to save Hoshido from being conquered while the latter has him do the bidding of Nohr’s power-hungry King Garon. Whichever route the player picks, King Garon is explicitly depicted as stern and cold-hearted man. Even so, Corrin is defensible in becoming a royal pawn as it allows him to coordinate with his trusted brethren, minimize casualties, and reveal the true nature of the twisted king. Birthright is more along the lines of a classic Fire Emblem with a “straightforward” villain, but it’s definitely spruced up by the drama inherent in clashing with beloved friends. Conquest, meanwhile, is a stress-laden tale that sees its protagonist not just clashing with Hoshido but with the powers that be as he frantically scrambles to prove his loyalty while maintaining his sanity. It’s truth versus ideals and Fire Emblem’s shades have never been this shade of sombre grey. Fates makes a point of highlighting the diversity of the two warring countries. Hoshido has a distinctly Japanese aesthetic that, surprisingly, hasn’t been particularly attempted in 10+ instalments of a game series from Japan. This theme forms the basis for all of Birthright’s presentation, aesthetics, and world design. Maps occur in locales with feudal architecture and cherry blossoms, classes include ninja and samurai, and bows are outright classified separately as Yumi. Nohr, meanwhile, boasts the classical references to Norse mythology with a hint of westernisation, which is more par for the course. Seemingly inconsequential discrepancies like a bow being classified as two different weapons wind up being more than cosmetic, though, and yield narrative value. Although key members of each forces are trudging along for righteous causes, characters on both alliances inevitably sling bigotry and abhorrence. Others express their nationalist views or blatantly state their desire to slaughter as many soldiers as possible. The reason for incessant bloodshed isn’t just King Garon’s ambition; the propaganda, the racism, and the hostile attitudes expressed by bit players add incessant fuel to a scorching fire. Despite the media’s emphasis on censored content prior to the game’s release, Fates is among the darkest games of its ilk, possibly since the Jugdral duo back on the Super Famicom. That’s really quite a feat since previous games weren’t very peachy, but I’m struggling to recall many other Nintendo games that have had the player wipe out an entire race, take and manipulate war prisoners, or guide so many tragic characters. I’m simultaneously impressed and perplexed the localisation staff kept the bulk of this heavy-handed material intact while altering a harmless petting mini-game of all things, but that’s neither here nor there. The supporting cast on both sides feature those with bloodlust, abused children, and survivors that have had their villages wiped out. These disturbing themes aren’t ever glorified but hit home hard in the context of the endless misery the protagonist must endure without snapping. Related reading: Fire Emblem: Sacred Stones is a good choice on the Nintendo Wii U Virtual Console if you're looking for a classic Fire Emblem experience. As noted earlier, a third version of Fates called Revelation exists and has been openly acknowledged as the canonical path. It unfortunately does more to diminish than enhance the formula of Birthright and Conquest. Don’t get me wrong - from a purely technical standpoint, this iteration ties up loose ends in the plot, encourages the two nations to understand one another, and grants player access to goodies that aren’t otherwise obtainable in one save file. The complaints arise from the tale itself. In this rewrite, Corrin founds a more personal army designed to end the war as peacefully as possible rather than side with either army. Corrin is promptly vilified by all, but slowly gains enough rapport to recruit the vast majority of the cast in Birthright and Conquest. Revolution’s conflict is not devoid of gore or sacrifice by any means but it does feel a tad too perfect in how everything and everyone comes together. 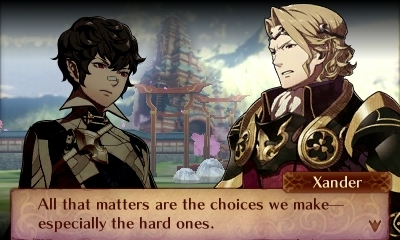 I preferred the shock of picking Hoshido and watching my bias towards its fighters dissipate upon seeing Nohr’s perspective. Here, idealism compromises the brazen ideas the directly opposing games put forth. Speaking of brazen, Fates makes some adjustments to the franchise’s formula that will prove just as controversial. After Fire Emblem Awakening’s exceptional sales rescued the series from Nintendo’s chopping block, though, this was an inevitability. 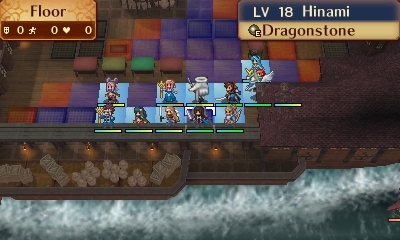 That game retooled a number of existing Fire Emblem paradigms such as romance and children, support conversations, the option to disable permanent character death, and a world map to form a package that better resonated with a broader audience. As is always the case when an IP attains mainstream status, though, Awakening was divisive in certain circles and polarised fans who wanted strategic gameplay without having to adapt to its tweaks. Considering we had three reviewers tackle that one and it was unanimously praised, though, we’re not exactly up in arms. Fates is very much a continuation of Awakening in terms of presentation and casual-friendly mechanics. It goes a touch further by introducing Phoenix Mode, which sees characters being resurrected almost instantaneously and thus neuters difficulty to comical degrees. This might irritate those who swear by the likes of Thracia 776 and Radiant Dawn (two of the franchise’s most gruelling entries that pushed the limits of challenge and map creativity), but I feel it demonstrates Nintendo’s confidence in the game’s value as a narrative experience. Having said that, Nintendo has clearly acknowledged the thirst for a more traditional and mentally stimulating outing. As such, Birthright and Conquest have been designed with alternate audiences in mind. It’s a clever compromise that is far more than the “marketing ploy” it’s been painted as. Instead of being weighed down by the need to grind, those who play Conquest flat out don’t have the option. Having children isn’t just a neat bonus – it’s a necessity to maximise experience point distribution similar to side chapters in earlier entries. Hard mode can be pretty brutal and Lunatic will have most curling into a fetal position very quickly. It would have been neat to see Intelligent Systems go a touch further by implementing limited weapon usage in this version for a more “classic” approach, but the current model is a welcome deviation from the norm. Birthright, Conquest, and Revelation definitely overlap in terms of assets, mechanics, and presentation, but the end result is that open-minded players get three times the regular recommended dose of Fire Emblem. Each slice of Fates’ virtual pie serves up more than you’d expect from a standalone release. That some have compared it to the split paths in Sacred Stones is mindboggling. Oddly enough, many of the formula shakeups here can be linked back to Fire Emblem Gaiden, which is the second oldest game in the series and didn’t garner a huge following even in its native country. Prior to Fates, it was the only game where players didn’t have to manually maintain their warriors by outfitting them with new weapons every time they degraded through battle. Here, any weapons besides staves can be used infinitely without breaking, which deeply affects how micromanagement functions. The rational fear was that players could just acquire the finest trinkets and abuse them without consequence, but this is thankfully a case of crisis averted. The strongest tools are balanced by weakening the user in various ways so as to prevent any single unit from razing maps in solitude. In addition, finding optimal equipment takes experimentation and some serious wading through inferior instruments. Related reading: Fire Emblem is exclusive to Nintendo, but for PlayStation 3 owners Tears to Tiara 2 is a great alternative. Matt's full review. Also reminiscent of Gaiden is an area that players can freely traverse on foot, this time referred to as My Castle. The key difference is that the player decks out this area themselves with shops, statues, prisons, and weaponry. This, by far, is the most valuable feature implemented in years and gives greater context to the downtime at war. There’s not a ton of estate to work with, but the customisation and non-battle functions go a long way towards furthering the importance of character relations. What impressed me above all else, though, is how much battle maps have evolved. The designers went out of their way to make level designs far cleverer than recent entries. Well-executed twists make the time honoured “seize the throne”, “rout the enemy”, and “defeat the boss” mean something again. 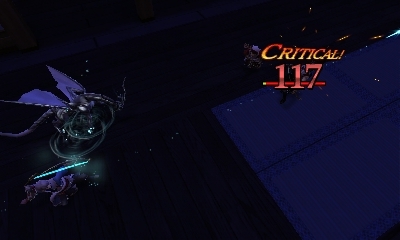 One of the “rout the enemy” missions isn’t just about killing; it requires players to figure out how to stop enemies from spawning indefinitely. New mission objectives aren’t bad either, with one requiring Corrin to hunt down a traitor responsible for draining the army’s coffers each turn. There are maps that clone your entire party, ones with accessible stairs that lead to other floors, ones in trippy dimensions with moving platforms, and more than I could possibly list here. The bulk of them incorporate points that can manipulate the structure of surrounding areas or trigger enemy traps, which range from neat gimmicks to borderline mandatory on the tougher difficulties. No prior entry has been so dynamic. In Fates, the score plays a grander role than ever before, conducting the atmosphere of the entire game with its sincerity and prophetic lyrics that slowly become clear. I suspect that, ten years down the road, these games will be identified by the first line from the iconic theme music, “you are the ocean's gray waves”. This one piece is sung by a songstress who plays a pivotal role in all routes of the story and sneakily manifests itself throughout the journey similar to the Pigmask Army theme in Mother 3. Even the mood of battles is governed by the music like never before. A particular song will play during each map only to be interrupted by a more emotionally-driven version of that same piece when a unit initiates a skirmish; this is the rare video game soundtrack that can’t be faithfully dumped onto an audio CD. Fire Emblem soundtracks have always been stellar, but Fates integrates its music to artistic effect in a manner more games ought to strive for. Fire Emblem Fates still approaches war from a largely idealistic standpoint, but it makes a quantum leap forward by representing a broader range of viewpoints along the way. For a series that has changed incrementally over the last 25 years, this latest entry is a refreshing reinvention.